Tag line: "TERROR! Stalked the Brush-Choked Island...Where Men Who Were Animals Sought the Girl Who Was All-Human!" Based on H.G. Wells' The Island of Dr. Moreau, Island of Lost Souls is a fascinating motion picture, released at a time when the horror genre was taking Hollywood by storm, and though it shares similarities with several classic Universal monster movies, this Paramount Studios offering still manages to stand apart from the rest. Edward Parker (Richard`Arlen) is the only survivor of a shipwreck. Rescued by a passing freighter, Parker soon angers the ship's captain (Paul Hurst), who, instead of taking him to the nearest port, drops Parker off on a remote South Seas island, where the mysterious scientist, Dr. Moreau (Charles Laughton) resides. But Moreau is not alone; also on the island are a race of beasts, creatures the scientist himself created in his laboratory. Chief among them is the lovely Lota (Kathleen Burke), also known as the Panther woman. Hoping to prove Lota is as human as any other female, Moreau attempts to lure Parker into mating with her, but his horrified guest will have none of it, and instead tries to escape the island so he can return home and marry his fiancee (Leila Hyams). 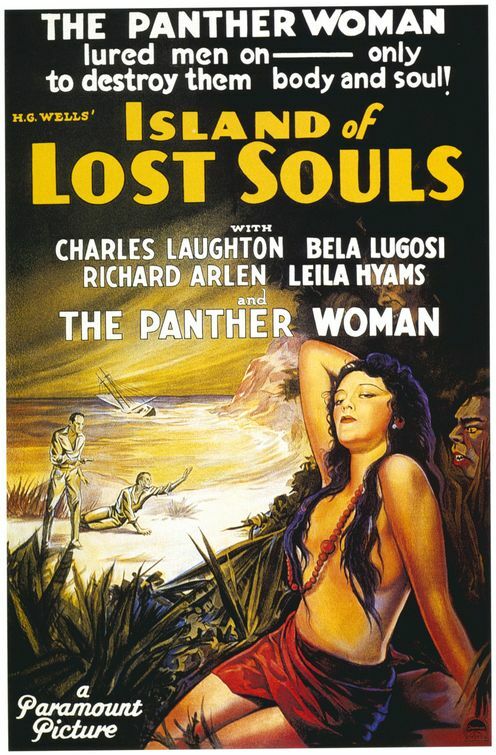 Like Universal's Dracula and Frankenstein, both of which debuted the year before, Island of Lost Souls tells a tale of humanoid monsters. But where the monsters were the primary cause of chaos in the earlier films, in Island of Lost Souls, they are clearly the victims. One key scene has Parker rushing in to Moreau's lab to investigate several blood-curdling screams. Upon entering, he finds Moreau and his assistant, Montgomery (Arthur Hohl), hard at work dissecting one of the creatures, which is lying on the table, fully conscious. Tortured and manipulated in the name of science, the various beasts of the island prove much more sympathetic that their obviously mad landlord, a man who believes himself a God, and has, to that end, created an entire race of beings to worship and fear him. In Frankenstein, Colin Clive's Victor Frankenstein also compares himself to the Almighty (“Now I know what it's like to BE God”, he shouts when his monster first breathes life), yet his was clearly a reaction to the moment. It isn't long before Frankenstein regrets his 'experiment', thus dispelling all notions of divinity he may have once harbored. Moreau is another matter. Standing on a hill overlooking the creatures' village, he smiles as their leader , played by Bela Lugosi, praises him. “His is the hand that heals”, Lugosi shouts, and as he does, Moreau raises his arms, drunk on the adoration being sent his way. Charles Laughton is devilishly sinister as Moreau, a man who takes pure delight in his work, whether it be teaching Lota how to act more human, or cutting open one of his 'creations' in the lab (a room the beasts refer to as the 'House of Pain'). Showing no remorse whatsoever for the destruction and death he has caused, Laughton's Moreau is a loathsome individual, and the actor's performance, combined with an incredibly dark story of science run amok, transforms Island of Lost Souls into one of the most shocking horror films of the 1930s. Interesting choice of film and plus I now know where they got that episode of the Simpsons from (the tree house of horrors were DR. Hibbert turns everybody into animals.